The Office of Sustainability presented UIC’s progress and goals to improve environmental performance during a talk April 10 in the Latino Cultural Center. 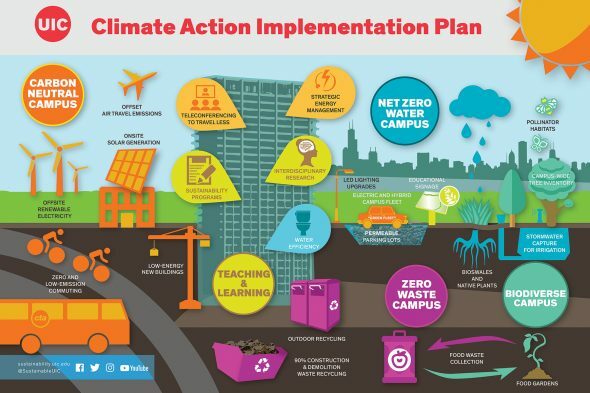 The talk’s focus was the Climate Action Implementation Plan, a decade-long model of resource planning made for updating UIC’s formal Climate Action Plan. 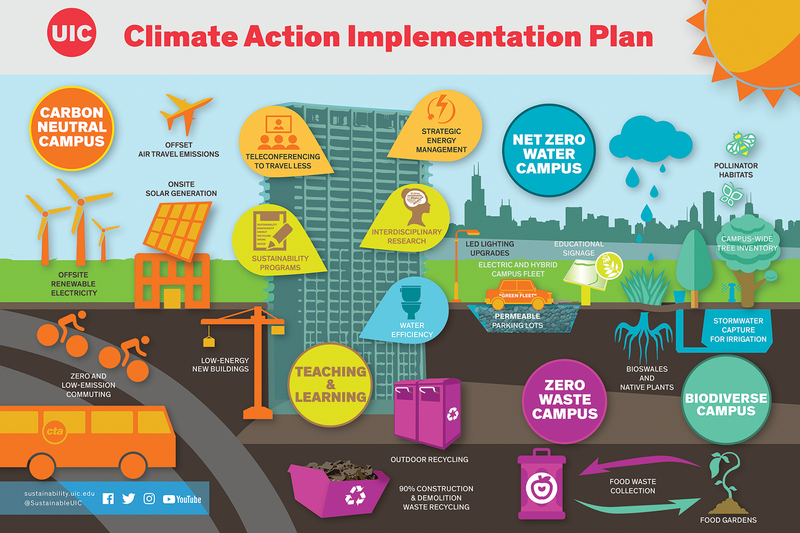 The action plan outlines specific steps for implementing the UIC Climate Commitments, which include becoming a carbon neutral, zero waste, net zero water and biodiverse campus. The implementation plan includes seven strategies that will help UIC reach those aspirational commitments and more. “This plan is actually economically based and proposes the investments that are needed to get to the goals,” said Cynthia Klein-Banai, associate chancellor for sustainability. Klein-Banai presented a graph with past greenhouse gas emissions and a forecast of future emissions, which include the university’s energy use and transportation to, from and around campus. Growth information was based on projections within the Campus Master Plan. “Those additional buildings, the growth in the student body, if we do nothing to address our carbon emissions, [they] would increase and then it levels off,” Klein-Banai said. Doing “business as usual” would also hike up energy consumption and costs. The graph was one example of how the implementation plan models and evaluates potential solutions for issues related to making UIC a more sustainable university. Focus areas and solutions were prioritized based on their financial and environmental impacts. Klein-Banai touched on developments and key goals for some strategies. The new Bigbelly Solar compacting trash and recycling containers on the east side of campus, for example, have increased the outdoor recycling capacity on campus and reduced emissions. The containers will be expanded to the west side. Energy efficiency and conservation has a greater reduction potential: about 54,000 MTCO2e, or greenhouse gas emissions, by 2050. Quick payback projects include steam trap replacements and building energy retrofits. The plan proposes a Green Revolving Fund as a mechanism by which the implementation of cost-saving projects would generate more funds for green projects through returning the initial savings to the fund. Building green and efficient facilities is another potential area for carbon reduction. Klein-Banai said that building standards for the university are currently being updated. She said that the campus also has reduced total energy use by 23 percent since 2004. Informing people to do things like turning off lights, computers and more could have a cost reduction of 1.5 percent annually, which would allow the university to hire a staff member who could teach the UIC community about other energy-saving methods. The talk then switched to ideas for renewable energy sources. “We’re looking at indirect power purchase or some kind of power purchase agreement for off-site power,” Klein-Banai said. On-site options are also proposed. For natural resources and ecosystem services, retaining stormwater is important. The university has about 4 acres of green infrastructure that retains or slows stormwater down to avoid getting into the city’s Combined Sewer Overflow system. Increasing green infrastructure to 32 acres, and partnering with agencies who own the storm sewers could help UIC be more sustainable. Other ongoing initiatives are keeping the campus green. A tree inventory with Bartlett Tree Experts is ongoing, and UIC is finalizing a Campus Habitat Pollinator Plan. Food production spaces are being supported through Heritage Garden and the College of Applied Health Sciences, which houses a Nutrition Teaching Garden. For recycling, the campus rate is at 45 percent, thanks to initiatives such as increased food scrap collection. Food recovery efforts include student organizations and Dining Services collecting food after events and a plan to get new contracts with food waste collectors. UI Hospital is piloting a program and has plans to expand. About 50 tons of food scraps are collected annually. CAIP’s solutions would help UIC reach a greenhouse gas emissions reduction goal of 40 percent by 2028. “We believe we can get there with the investment,” said Klein-Banai. The implementation plan was prepared by the Office of Sustainability in conjunction with the Chancellor’s Committee on Sustainability and Energy.